Print Quality Guide for the Primera LX2000 Color Label Printer. > Knowledge base> Article: Print Quality Guide for the Primera LX2000 Color Label Printer. 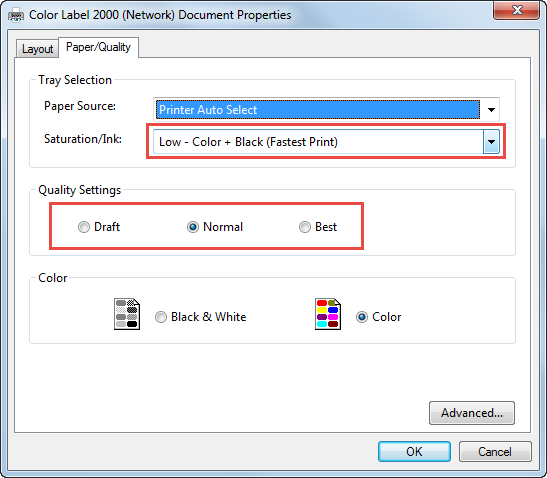 Print quality, cartridge settings and saturation are controlled by two settings in the driver. Saturation/Ink and Quality. You can access the driver settings before you print from any application by clicking the preferences/properties button or you can change the settings in Devices and Printers. 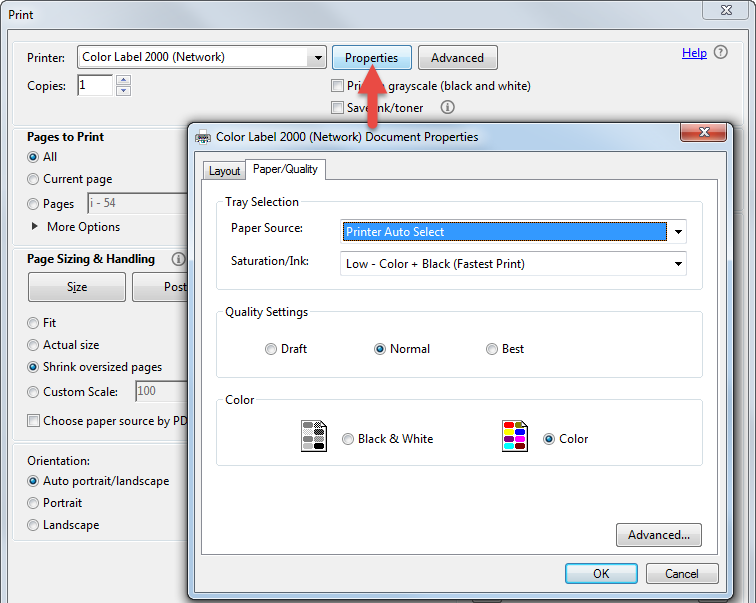 To be sure you have changed a particular setting change it from both Devices and Printers and before you print. 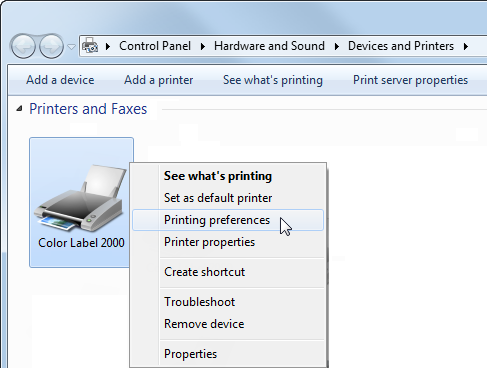 Right click on the printer and choose "Printing preferences." Click on Properties before printing. These settings will provide the most dramatic quality differences. USE COLOR ONLY SETTINGS IF YOUR LABEL WILL CONTACT WATER. 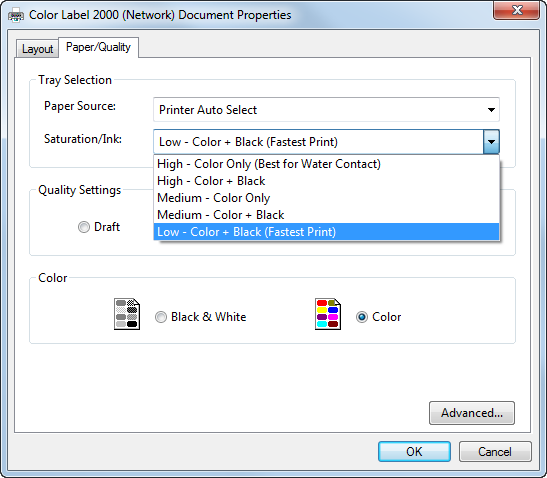 The higher saturation settings will print slower and use more ink while the lower saturation settings will print faster and use less ink. Medium - Color Only - Water Contact Setting. Low - Color + Black - Fastest Print - Least Ink Consumption. Within each Saturation/Ink setting you can also adjust Quality to Draft, Normal and Best. These are simply finer adjustments within each saturation/ink setting. Draft quality modes are only available for the low saturation/ink setting. Note 1: Wait 24 hours before allowing labels to come into contact with water. 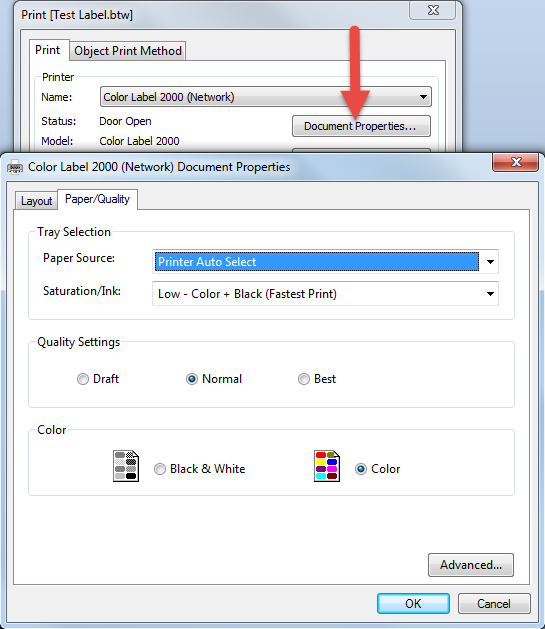 ** When in the highest possible quality setting the driver also allows you to select the "Print in Max DPI" mode which is the best possible quality. Many media types will not be able to accept the amount of ink used in this mode so it could actually make the prints look worse. Click on the Advanced button to access this setting. Is the LX900 networkable? Can I use a USB to Ethernet Print Server?